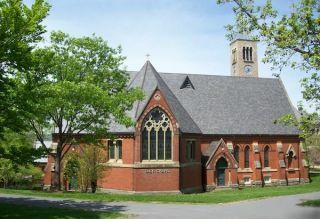 Erected in 1875, Sage Chapel sits near the center of the picturesque campus of Cornell University in upstate New York. It is expressly non-denominational, and its interior is adorned by symbols of all the major and minor religions from around the world. For services and other events, Sage Chapel seats over 700 people, plus a large choir. To help voices carry with intelligibility in the large space, its sound reinforcement system has evolved with the state of technology over the decades. Apart from the chapel’s two organs, the system also provides reinforcement for any musical instruments used. Its latest upgrade condensed seven feet of rack space used for 1990s-era processing and amplification into just seven inches using an Ashly Pema 8250 and an Ashly ne4250pe. Each unit combines Ashly’s Protea signal processing with clean, high-powered amplifier channels – twelve in all. With its fully-implemented front-end processing capabilities, the Ashly Pema 8250 now takes care of all of the “everyday” mixing and processing chores. It also delivers eight 250-Watt amplifier channels, all within two rack spaces. Because the Pema 8250 also includes line-level outputs from the processing section, it feeds the four-channel Ashly ne4250pe amplifiers with optional processing. All together, the system provides twelve 250-Watt amplifier channels and all of the processing they require in a tamperproof package. An Ashly neWR-5 wall panel remote control provides simple selection of several presets. At its most basic, the Ashly Pema 8250 auto-mixes all of the usual inputs. The presets also allow selection of arrangements for other common event scenarios. For more complicated events, a console can patch in and take control of the inputs. Calf Audio is usually called in to provide sound engineer support for those more complicated events.